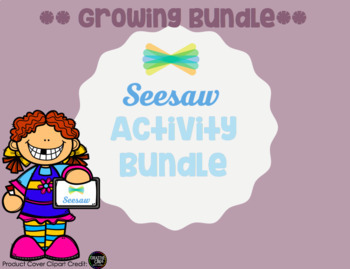 As I create more Seesaw Activities I will add them to this bundle. Buy now before the bundle grows and the price goes up! I made this to use in my classroom with Seesaw. This can of course be used paperless but if you have a tablet that can use Seesaw I encourage you to try it out! Your kids will LOVE it! 5. Edit your settings. Want to add voice instructions? Attach an example? 6. Add this template to the 'Student Template' section. 8 easy steps and you have an activity your students can use ALL YEAR LONG!